We love using cauliflower in place of rice as an all-veg replacement and we think using riced cauliflower as a pizza crust is just brilliant! 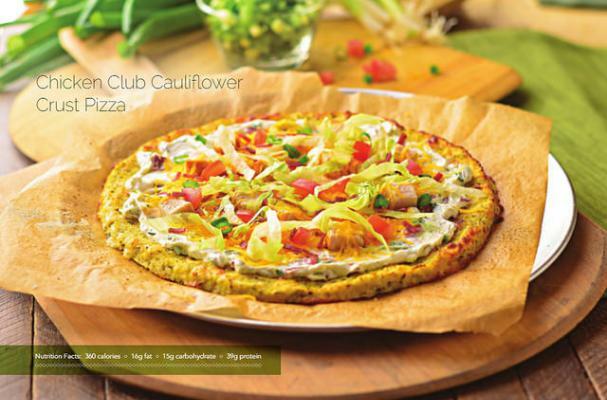 This Chicken Club Cauliflower Crust Pizza recipe is courtesy of the Medifast cookbook Simply Well: An Everyday, Healthy Cookbook, but you don't have to be on a Medifast diet to enjoy the healthy and delicious recipes. To make the pizza, you first pulse a head of cauliflower in a food processor until it becomes the consistency of rice. Cook the riced cauliflower briefly in the microwave, then squeeze the excess moisture out. Combine it with egg, low-fat mozzarella cheese and dried oregano then press into the shape of a pizza crust. Bake for a few minutes then spread on the creamy low-fat ranch dressing, top with cheese, chicken, and turkey bacon, and bake some more. Finally, top with lettuce and tomatoes and enjoy! Step 1. Preheat your oven to 425˚ F.
Step 2. Place cauliflower florets in a food processor and pulse until they become very fine rice-like pieces. Step 3. Place cauliflower "rice" in a microwave-safe bowl, and cook for 7 to 8 minutes, stopping midway to stir. Step 4. Once cooled, transfer the "rice" to a cheesecloth or clean, thin dishtowel, and squeeze out as much liquid as possible. Step 5. In a large bowl, combine "rice," egg, mozzarella, and oregano, until thoroughly mixed. Press the mixture out into the shape of a pizza crust, about 1∕3-inch to ½-inch thick (make sure crust isn't too thin), onto a baking sheet lined with parchment paper. Bake for 15 to 20 minutes, until crust is firm, and light brown. Step 6. Meanwhile, combine ranch dressing mix, Greek yogurt, cream cheese, and scallions. Cook turkey bacon according to package directions, and chop into small pieces. Step 7. Once crust is cooled, spread ranch mixture evenly onto crust. Top with half of the cheese, chicken, remaining cheese, and bacon. Cook an additional 5 to 7 minutes, until cheese is melted and crust is golden brown. Top with lettuce and tomatoes. Editorial disclosure: this is not a paid endorsement for Medifast. Foodista received no payment or product for this post.